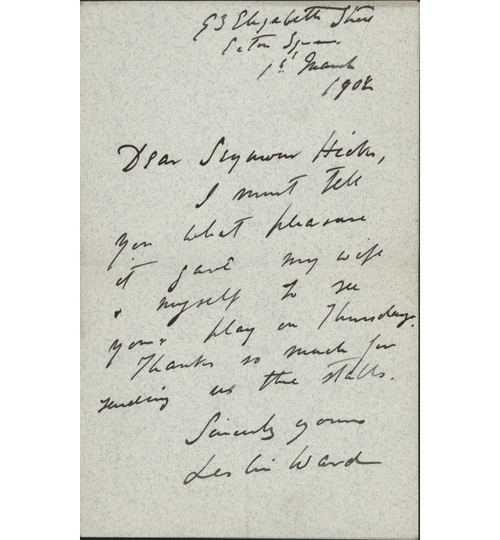 Autograph Letter Signed, to Seymour Hicks, thanking him for the tickets, saying what pleasure it have him and his wife “to see your play on Thursday”. A good one page example, 7 x 4½ inches. 93 Elizabeth Street, 1 March 1902. Sir Leslie Matthew Ward (1851 – 1922), portrait artist and caricaturist who drew or painted numerous portraits which were regularly published by Vanity Fair, under the pseudonyms “Spy” and “Drawl”.